A new study by German think tank Agora Energiewende looks into what solar power with storage would need to cost to be competitive with other optimized growth scenarios. Craig Morris says the findings need to be heeded. In March, Agora Energiewende published a report investigating the various growth scenarios to determine how Germany’s energy transition could be made more affordable. The main comparison was between a resource-driven scenario and a consumption-driven scenario – in other words, should wind turbines and solar arrays be built in concentrated clusters with the best wind and solar potential, or should they be installed as distributed systems close to where power is consumed? In a nutshell, the study found that the much touted concentration on the best resources leads to greater demand for grid upgrades and power storage (or power losses if not stored). In other words, the overall power supply costs are competitive if wind turbines and solar arrays are installed across the country close to consumption points. 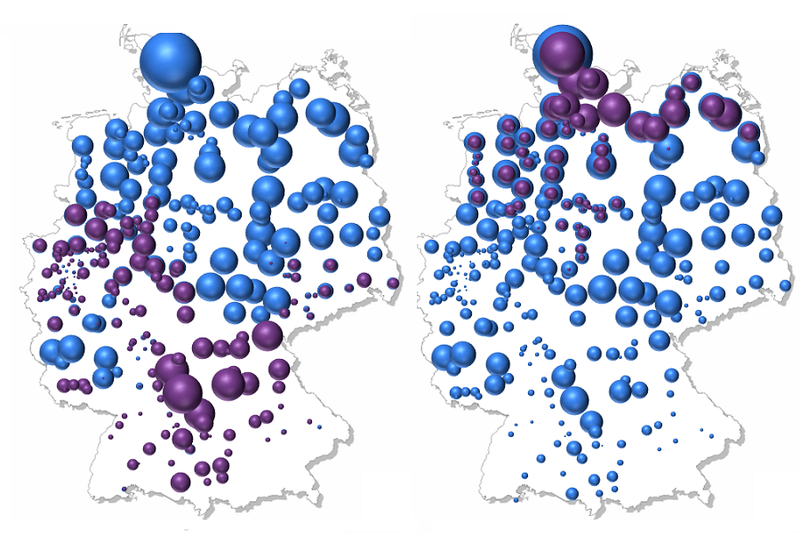 The new study (press release in German) investigates the main storage trend in Germany now: PV arrays with batteries. The findings support something I wrote in April: Germany is going down the wrong path with the focus on storing solar power. Specifically, Agora investigated a scenario in which 150 GW of photovoltaics is installed along with 40 GW of battery output (the storage capacity is apparently 120 gigawatt-hours) and found that the cost of such a combined system would have to drop by 80 percent over the next two decades for this alternative to be cost-competitive with the other two optimized scenarios (resource-driven and consumption-driven). At first glance, the proposal of 150 GW of installed PV may seem outlandish. Germany currently has more than 33 installed, and it plans to discontinue feed-in tariffs for solar when the target of 52 is reached. But at that point, solar will not come to a screeching halt; already, feed-in tariffs for new systems come in at only two thirds of the retail rate, so solar will continue to be built as long as grid access – and priority on the grid – is granted. Yet, the country only has peak power demand on summer afternoons between 60 and 70 GW. We already know that solar power production peaks on sunny days at roughly 70 percent of installed capacity, so 52 GW of installed PV would regularly provide around 35 GW of power. Likewise, 100 GW of PV would provide 70 GW of power; 150 GW of PV, around 105 of solar power – hence the need to store 40 of that, as assumed in the study. Even more ambitious proposals are already on the table, such as 200 GW. But Agora’s study suggests that, while technically feasible, the entire approach is “highly unlikely” to become cost-competitive over the next 20 years. The price of a PV array with battery storage would have to drop by 80 percent. My conclusion remains the same as in 2010: we need to focus on “peak demand parity” – when production a particular source of energy (such as solar) meets the power demand (for solar, on summer afternoons) and further growth requires storage. In the case of Germany, with higher power demand in the winter than in the summer, we therefore need to ramp up wind power faster than solar because the latter eventually requires seasonal storage. What is the assumed cost of storage? Is it high compared to the several lower cost solutions that are in beta site testing or otherwise headed to the market right now? mds, Agora’s study does not attempt to project any cost developments for PV or solar. Rather, they simply say what the price will have to drop to for combined PV + storage systems for the combination to be a good option. 80 % cost reduction in battery+PV system price is not that big. The price of solar dropped 80 % in just four years and there is no reasons why this trend cannot continue. Also battery technology is getting c. 10 % cheaper annually. So 80 % system price cost reduction is achieved around 2025. And this is of course in Germany, where weather conditions are poor for solar. In Germany solar system price is just €1000 per kW at its lowest. Also there is currently very little data how battery systems actually perform in real life. It is very probable that this analysis does exaggerate the actual cost of battery storage systems. There is lots of optimization to be done. Also second hand electric vehicle batteries does make splendid and cheap solar storage capacity for households. As around 2025 half of the cars manufactured are fully electric, there is no shortage of second hand car batteries in 2030’s. I have to say that I find it very unlikely we’ll see storage cheap enough for seasonal storage in our lifetimes. And seasonal storage isn’t needed. The one exception would be that ample input from wind/solar/whatever might let us hold back hydro production and use it most during the high demand season. More of a reserve of potential rather than actual storage. Anyway to be notified of new comments on this thread? Bob, Agora does not specifically assume any price for PV or storage. They simply say what the combined price of PV + storage will have to be for it to be affordable. Where can someone get a copy of the report? There is a lot in this article that doesn’t make sense, and having the article may clarify my questions. In the graphic above, all the dots are the same in both scenarios, but the caption says “the blue circles represent current installed capacity; the purple, what would need to be added” ? I am also not sure how you can make the statement “The price of a PV array with battery storage would have to drop by 80 percent.”, without looking at the economics and having numbers for the base case and the renewable case? In any event, what happens when the wind doesn’t blow 24/7? (from another report, the northern additions appear to be mostly offshore wind) Or the sun doesn’t shine for a week? Would the assumption then be to burn fossil? If so, I agree; a fully or partially depreciated fossil plant would be less expensive than a new battery installations. But you have only partially decreased your overall air emissions profile. Perhaps something was lost in the translation?